It's time to reach your full potential! IC Red is everything you could want from a pre workout and/or energy supplement. Every container provides you with 60 scoops, 30 full servings of active ingredients. You won't find fillers here! 5 based on 21 reviews. Leave a Review. Ive reviewed this before but it bears repeating. This is by far the best pre workout i have taken. No severe spike or crash with it. I really like IC Red. I just started getting serious (relative to me) with weight training back in November and IC Red has fueled all my work outs. I keep going back for more. It is smooth and tastes great. My work outs are about 90 - 120 minutes on average and I am fueled all the way through! I have been powerlifting for about 3 years and lifting weights longer than that. I have wasted my money on many pre-workouts that either don't work or are just packed with caffeine. This pre-workout is the perfect blend. I don't get a rush, I get a sense of concentrated energy and focus. 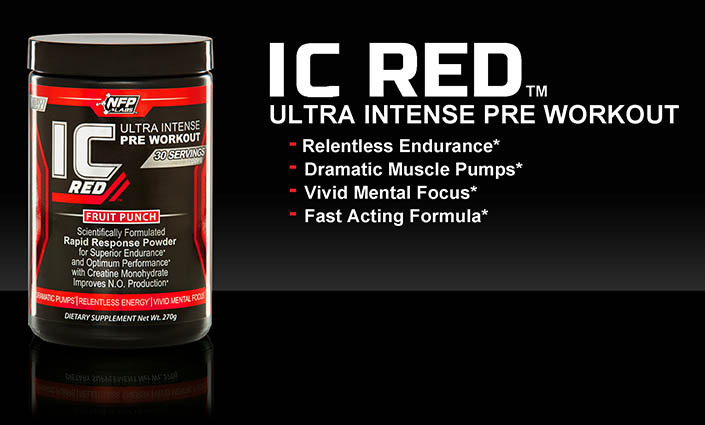 IC Red is truly the greatest pre-workout on the market! I have tried my fair share of pre workout over the years and I either feel nothing or it hits me like a ton of bricks. IC Red is by far the best pre workout I have ever used. It gives me a level of concentration like nothing I have ever taken. It's not only the perfect product but it's fairly priced. This is an all around great product and I recommend it to everyone I know! Very impressed with quality of the product. I've tried C4, Super Pump Maxx, etc and they all taper off with extended use. For me this usually happens at about day 30 taking it 3-4x/week. but I haven't reached that point yet and I'm on about day 45-50. So I'm very happy to spend money on something I can use and get results for a longer period of time. Best pre-workout around by far. No jitters, great focus and amazing pumps! My husband has been lifting for 35 years and this is literally the ONLY pre-workout that he has ever been happy with - he actually feels it. I love IC Red! It gets me fired up and pumped for both my powerlifting workouts and my CrossFit wods. I'd recommend it to everyone! I've used Cellucore products in the past and IC Red far exceeds C4. Plus, IC Red is less expensive and tastes 10x better! !